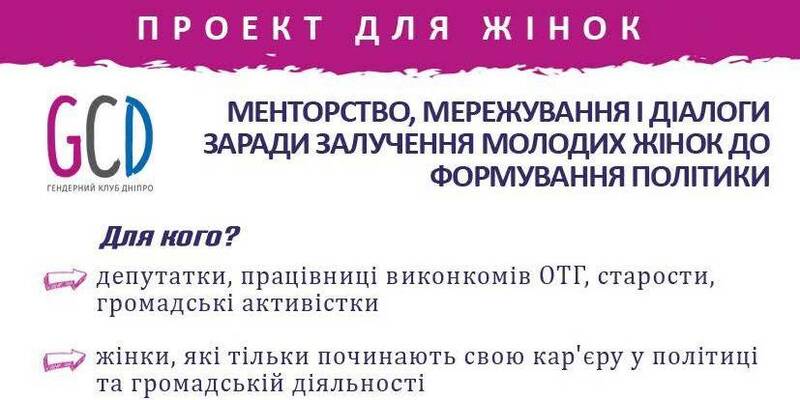 NGO “Dnipro Gender Club” with the support of the U-LEAD with Europe Programme announces a competition for participation in the project “Mentoring, networking and dialogue for the purpose of attracting young women to policy-making”. The project is being implemented in four AHs of the Dnipropetrovsk Oblast: Krynychanska, Ilarionivska, Mykolayivska (Petropavlivka Rayon) and Novooleksandrivska hromadas. It will facilitate the effective involvement of women in policy and decision-making, and increase the gender balance in relevant local institutions. The project will be implemented during April-October 2019. The first training is to be held in early April. Participants will be selected on a competitive basis.